Why are you still carrying her? Tanzan and Ekido were two monks who were walking from one lodging temple to the next down the unpaved paths that were the only way of travelling in those times. As they rounded a bend in the path, they saw ahead of them a muddy stream, and standing at the edge was a beautiful young woman dressed in a silk kimono and sash. As they approached, she asked them for assistance in crossing the stream. 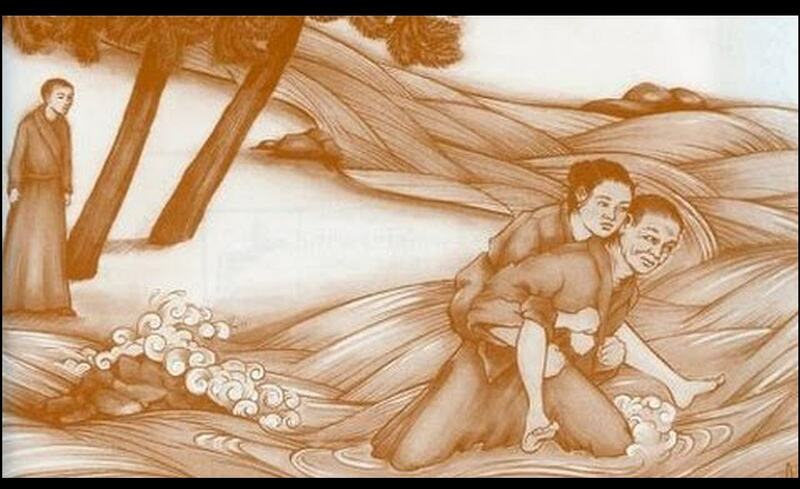 Tanzan gathered her up in his arms, carried her across and set her down on the other side. They went their separate ways. Ekido was silent for the rest of the day, but he was fuming inside. When they got to the lodging temple that night, he could restrain himself no longer. It’s a central teaching of Buddhism that attachment to our opinions, our judgements, our prejudices are the cause of suffering. When we are attached to this baggage, we are the only ones it weighs down. Ekido suffered all day, Tanzan didn’t.